We’d love your help. Let us know what’s wrong with this preview of The Pioneer Detectives by Konstantin Kakaes. Explore one of the greatest scientific mysteries of our time, the Pioneer Anomaly: in the 1980s, NASA scientists detected an unknown force acting on the spacecraft Pioneer 10, the first man-made object to journey through the asteroid belt and study Jupiter, eventually leaving the solar system. No one seemed able to agree on a cause. (Dark matter? Tensor–vector–scalar gravi Explore one of the greatest scientific mysteries of our time, the Pioneer Anomaly: in the 1980s, NASA scientists detected an unknown force acting on the spacecraft Pioneer 10, the first man-made object to journey through the asteroid belt and study Jupiter, eventually leaving the solar system. No one seemed able to agree on a cause. (Dark matter? Tensor–vector–scalar gravity? Collisions with gravitons?) What did seem clear to those who became obsessed with it was that the Pioneer Anomaly had the potential to upend Einstein and Newton—to change everything we know about the universe. With riveting prose and the precision of an expert, Konstantin Kakaes gives us a scientific police procedural, tracking the steps of those who sought to unravel this high-stakes enigma. His thrilling account draws on extensive interviews and archival research, following the story from the Anomaly’s initial discovery, through decades of tireless investigation, to its ultimate conclusion. 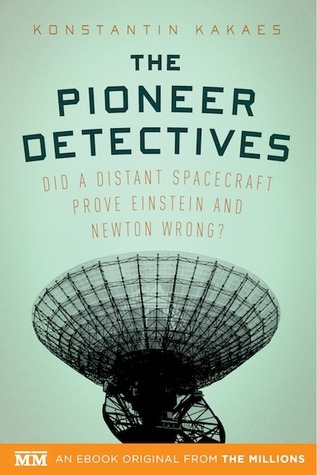 “The Pioneer Detectives” is a definitive account not just of the Pioneer Anomaly but of how scientific knowledge gets made and unmade, with scientists sometimes putting their livelihoods on the line in pursuit of cosmic truth. Perfect for fans of John McPhee, Thomas Kuhn, and Ed McBain, this is also an immensely enjoyable story accessible to anyone who loves brilliant, fascinating long-form journalism. To ask other readers questions about The Pioneer Detectives, please sign up. This was a fascinating look at the search to figure out why NASA's Pioneer probes accelerated very slightly slower than Einstein's theory of general relativity would predict, an effort spanning decades- nearly the entire careers of some of the scientists involved. The descriptions of the science were clear and easy to read, as were the struggles against outside forces like budgets and data preservation and the excitement of new equipment and techniques that could be applied to the problem, thing This was a fascinating look at the search to figure out why NASA's Pioneer probes accelerated very slightly slower than Einstein's theory of general relativity would predict, an effort spanning decades- nearly the entire careers of some of the scientists involved. The descriptions of the science were clear and easy to read, as were the struggles against outside forces like budgets and data preservation and the excitement of new equipment and techniques that could be applied to the problem, things I find too rarely discussed in popular treatments of scientific research in my reading. This is a quick and engaging popular-science book, recounting the history of a challenge to Einstein's Theory of General Relativity, which describes the workings of gravity. The challenge arose from anomalous data about the travels of the Pioneer 10 spacecraft. Kakaes lays out his tale with the clear language and assured pacing of an experienced journalist, and in many ways the book felt like a really good piece of long-form journalism (say from Slate or The Atlantic), without all the ads. In fa This is a quick and engaging popular-science book, recounting the history of a challenge to Einstein's Theory of General Relativity, which describes the workings of gravity. The challenge arose from anomalous data about the travels of the Pioneer 10 spacecraft. Kakaes lays out his tale with the clear language and assured pacing of an experienced journalist, and in many ways the book felt like a really good piece of long-form journalism (say from Slate or The Atlantic), without all the ads. In fact, if I have one criticism for the book, it is that it could have been longer. There were a lot of interesting hints about NASA politics, international trends in scientific research, and our understanding of the solar system -- any of which could have been expanded into a chapter. The flip side of this, though, is that the book stays focused. It's the first book I've read in an e-reader format, and seemed pretty ideally suited for it: interesting, short, not convoluted, good layout, sparing endnotes. The Pioneer Detective is about a small group of scientist who discover an anomaly in some of the data with regard to the speed of travel of the Pioneer 10 & 11 satellites. Unless explained this data would call into questions Einstein's Theory of Space and Time. This short work is the story of scientists investigated, theorized, and ultimately reconciled the data. A really interesting read that provides an example of how scientific theories come into being, how they are tested, and how dedica The Pioneer Detective is about a small group of scientist who discover an anomaly in some of the data with regard to the speed of travel of the Pioneer 10 & 11 satellites. Unless explained this data would call into questions Einstein's Theory of Space and Time. This short work is the story of scientists investigated, theorized, and ultimately reconciled the data. A really interesting read that provides an example of how scientific theories come into being, how they are tested, and how dedicated and intelligent these scientists were. Keeping this one short, as befits a short e-book. I read this while waiting for an interminably delayed flight to take off from San Diego International Airport, fully expecting to have to give up on it after a bit and seek lighter reading. To my surprise, I found myself engrossed, and quickly at that. The Anomaly (with a capital A, it was that Anomalous) was simple: the Pioneer spacecraft had been found to be accelerating just _slightly_ faster than predicted by Einstein’s theory of general relat Keeping this one short, as befits a short e-book. I read this while waiting for an interminably delayed flight to take off from San Diego International Airport, fully expecting to have to give up on it after a bit and seek lighter reading. To my surprise, I found myself engrossed, and quickly at that. The Anomaly (with a capital A, it was that Anomalous) was simple: the Pioneer spacecraft had been found to be accelerating just _slightly_ faster than predicted by Einstein’s theory of general relativity. The book is the story of the Anomaly and the people surrounding it: how it was discovered, how it shaped careers and lives and how, anticlimactically, it was ultimately resolved by building an elaborate thermal model of the spacecraft that showed that the Anomaly arose from the fact that one side of the Pioneer probe was slightly hotter than the other. Great science essay that explains a compelling mystery, clearly explains the science behind the investigation of the mystery, reveals the personalities of the scientists engaged in the mystery, and underscores the significance of the scientific method. Though the mystery itself involves some complex theories about how gravity works (or doesn't), the writing here is always clear, and can be easily understood by anyone interested in the story. What makes this essay better than most is the time Kaka Great science essay that explains a compelling mystery, clearly explains the science behind the investigation of the mystery, reveals the personalities of the scientists engaged in the mystery, and underscores the significance of the scientific method. Though the mystery itself involves some complex theories about how gravity works (or doesn't), the writing here is always clear, and can be easily understood by anyone interested in the story. What makes this essay better than most is the time Kakaes takes to tell the background stories of the scientists involved and the arduous process of collecting the necessary data from a space probe that many at JPL had abandoned. Kakaes also details the complications of pulling information from outdated technology, and hints that our own sense of history is threatened by the same process. There are also some great tidbits here regarding the plaque placed onboard Pioneer 10 (a precursor to the golden records on the Voyager probes), and which scientist could not resist putting his fingerprint on it. The Pioneer space probes, launched in the early '70s, appeared to travel infinitesimally slower than Einstein's theory of general relativity would predict. Was this evidence that Einstein's theory was wrong? If not, what was causing this strange anomaly? Pioneer 11 surprisingly remained in communication with scientists on earth decades beyond its predicted death. Kakaes describes the painstaking efforts of dedicated scientists who accumulated and analyzed the sparse and often corrupt data sent f The Pioneer space probes, launched in the early '70s, appeared to travel infinitesimally slower than Einstein's theory of general relativity would predict. Was this evidence that Einstein's theory was wrong? If not, what was causing this strange anomaly? Pioneer 11 surprisingly remained in communication with scientists on earth decades beyond its predicted death. Kakaes describes the painstaking efforts of dedicated scientists who accumulated and analyzed the sparse and often corrupt data sent faintly from well beyond Neptune, far beyond the limits of our solar system. Finally, in 2012, the researchers published their results. This is a great story about scientists finding a small inconsistency in their measurements, doggedly pursuing it for decades, overcoming animosity from peers and bureaucracy and.... not ending up with great discovery. As it happens almost always. We do not often hear stories like this, usually we read only about happy endings, so we underappreciate scientists effort and sacrifice. Without thousands of not-so-happy endings like this we would not have happy endings like theory of relativity, Higgs This is a great story about scientists finding a small inconsistency in their measurements, doggedly pursuing it for decades, overcoming animosity from peers and bureaucracy and.... not ending up with great discovery. As it happens almost always. We do not often hear stories like this, usually we read only about happy endings, so we underappreciate scientists effort and sacrifice. Without thousands of not-so-happy endings like this we would not have happy endings like theory of relativity, Higgs boson and pretty much all of modern science. This is a book about the hidden part of scientific process, which is usually edited out for convenience. Good read if you like space and science. Be warned that the book is quite technical. While you dont need to know anything fancy, you need to have an appetite for some technical discussions. The book is about an investigation into an unknown acceleration that was impacting Pioneer 10 and the story behind trying to decode it. The author gives a good background into the problem, and the people behind the investigation. The underlying theme of the book is a meta discussion on the scientific method a Good read if you like space and science. Be warned that the book is quite technical. While you dont need to know anything fancy, you need to have an appetite for some technical discussions. This review has been hidden because it contains spoilers. To view it, click here. The Pioneer I and II space probes are 200,000 miles short of where they should be. Over millions of miles this amounts to 0..02% anomaly, but nonetheless, an anomaly. This anomaly challenges Einstein's theories of gravity, dark matter and dark forces. The data streams for twenty years were analyzed down to the minutest detail included momentum of the radio signals that were sent from the Pioneer space probes. The answer was in the differential heating of the spacecraft by the sun and the radioact The Pioneer I and II space probes are 200,000 miles short of where they should be. Over millions of miles this amounts to 0..02% anomaly, but nonetheless, an anomaly. This anomaly challenges Einstein's theories of gravity, dark matter and dark forces. The data streams for twenty years were analyzed down to the minutest detail included momentum of the radio signals that were sent from the Pioneer space probes. The answer was in the differential heating of the spacecraft by the sun and the radioactive energy sources within the Pioneers themselves. A short interesting book about space travel and science. I wanted to hate this book. The tabloid question that is its subtitle is really annoying. Spoiler alert, the answer is no, the Pioneer Anomaly does not prove Einstein and Newton wrong. It was explained away as a result of heat dispersion. The beginning of the book was full of tabloid nonsense, too, like calling gravity a mysterious force. I forgave Kakaes by the end of the book, which is wonderful and reads like poetry. Science enthusiasts will love this book! A very well written account of the investigation on the anomalies of the pioneer space probes. It's just amazing to read about how far these probes are and how faint the strength of their signal is by the time it reaches earth. It also gives us an insight on how scientific inquiry works in general to solve mysteries. A.K.A. 'Science Is Hard'. This 65-page article is not quite the mind-boggling/awe-inspiring popular science that I was hoping for, but it's a useful illustration of the tedium, frustration, and disappointment that are part of even the tiniest amount of scientific progress. The 'coda' chapter is unexpectedly haunting. Great book about this "anomaly" that has caused the pioneer space probe to accelerate. Not too technical, and makes you think about how much we DO NOT really know about space and the universe. Nice short read on some interesting space science. Not sure it required a nine-chapter treatment but I enjoyed reading it all the same. Interesting but not really gripping. Short, sweet, and to the point. Easily grasped and intriguing science writing. Solid short read of the Pioneer anomaly that caused turmoil in the physics community for some time and how ultimately Einstein was right. A good read into how science works through puzzles. excellent synopsis of the detective work needed using only raw data and a pile of luck. Impressive tale of a non-discovery. Good writing about a very scientific topic. Short, way to short. there so much more to know before I have even the general knowledge every person ought to know. a very fine essay and a dip of toe into the fount of knowledge. wouldn't it be crazy if Einstein was wrong about gravity?!? he wasn't. but if he was. man. that would be something. A short but good e-book, combining two subjects I've always been very interested in: space exploration and physics. Highly technical discussion of the "Pioneer Anomaly"...an acceleration delta of Pioneer satellites. Read it only if you're a space-geek. Great read. Very nerdy, but approachable. I love the enduring science project and commitment to the project by the leaders. This is an absolute little gem if you're interested in astronomy/NASA/relativity etc. Very very neat.